Pittsburgh Steelers quarterback Ben Roethlisberger (7) throws the ball in front of Cincinnati Bengals defensive end Carlos Dunlap (96) during the first quarter at Heinz Field. 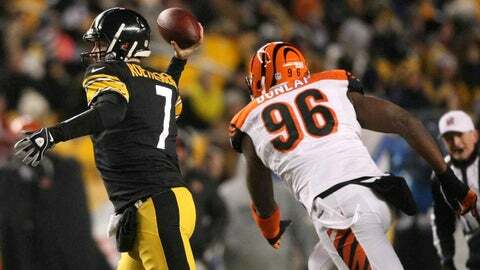 PITTSBURGH — There wasn’t much subtlety to the Bengals’ 30-20 loss to the Steelers Sunday night. They got beat across the board, including a defensive unit that has been the team’s calling card all season. This was as ineffective of a game as the Bengals’ defensive unit has played the entire season. But there are subtle stats that tell a story to any football game. The Steelers scored just two offensive touchdowns. Both came off of short fields; Pittsburgh needed to go a combined 48 yards to get their 14 points. Pittsburgh didn’t gain the most yards, convert the most third downs or put up any sort of gaudy numbers that stood out immediately but Sunday night was arguably the poorest performance by the defense all season for one reason: it didn’t get the Steelers and quarterback Ben Roethlisberger off of the field enough times when it had the chance. Pittsburgh converted just two of its 10 third down chances but through the first three quarters the Steelers had faced just five third downs. The Bengals were forcing an average of 5.8 punts per game coming into Sunday night, with at least three punts in every game. They got to three punts Sunday but after forcing the Steelers to punt on their first possession, Mat McBriar didn’t have to punt again until the fourth quarter. The Steelers punted seven times when the teams played in Cincinnati in September. The only other team to punt just three times against the Bengals was Green Bay, and the Bengals forced four turnovers in that game. They got just one turnover on Sunday. Roethlisberger was 20 of 25 for 191 yards, one touchdown and wasn’t bothered in the pocket until Wallace Gilberry sacked him in the fourth quarter. By that time the Steelers were more concerned with running time off the clock than anything else. No other quarterback has been that comfortable against the Bengals all season. All season the Bengals defense has made opponents uncomfortable. If the offense was bogged down, the defense was there to hold the fort until Andy Dalton & Co. could find itself. There was no fort holding Sunday. The Bengals forced just one three-and-out by the Steelers all game. That came on Pittsburgh’s first possession of the second half when Adam Jones intercepted a pass by Roethlisberger at the Cincinnati 2. When the Bengals had finally gotten on the board in the second quarter with a Giovani Bernard touchdown run, cutting Pittsburgh’s lead to 24-7, the defense needed to come up with a stop. That’s how comebacks work. The Steelers instead answered the touchdown with a field goal drive to take a 20-point lead at the half. Mike Zimmer’s defense has been one of the best in the NFL all season but it wasn’t Sunday night. The issues of tackling that surfaced in the second half against Indianapolis last week again plagued the Bengals against Pittsburgh. That’s something that needs to be fixed in the final two games against Minnesota and Baltimore. The way the game got away from us was disappointing.